In my bug-out pack, I have 3 different tools for obtaining safe drinking water in the wilderness. These include a filter with extra cartridge, water treatment pills, and a cookset (for boiling). In the survival box, there is only 1: a stash of water treatment pills. According to the EPA, rigorously boiling contaminated water for just 1 minute is enough to kill any bugs. Boiling is supposed to be the most effective way to disinfect water. The EPA also offers guidelines for using household bleach to disinfect water. They say a 1% solution of chlorine bleach requires 10 drops per quart of water. A 4-6% solution requires 2 drops per quart, and a 7-10% solution requires only 1 drop. Then you wait for 30 minutes. The water should have a slight chlorine taste. The EPA also states that cloudy or murky water is more difficult to disinfect. If you can't strain out the murkiness with a T-shirt or similar method, you should use twice the recommended amount of bleach. I suppose one could add a dropper bottle full of bleach to the survival kit rather than purchasing the pills, but to me the pills seem a better choice. According to my little bottle of water-disinfecting pills, I am supposed to put a pill in a quart of water, loosely cap the bottle, swish it around and let it sit for no fewer than 30 minutes. 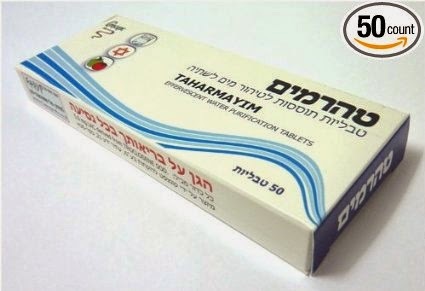 I recently purchased some Israeli water treatment pills because they come in convenient foil sheets that fit in your pocket rather than a breakable, awkwardly shaped bottle. The instructions are the same: a half hour. I used these to treat a few liters of water this past week. Because it was cold, I gave the pills an hour to do their thing. The water doesn't taste too bad, just a little chlorinated. In the past, I've used mainly the filter. I learned on my last outing that the filter freezes up when it's cold (duh). If it's really cold, the treatment pills don't work either because the water freezes up during the half hour to an hour needed to kill any bugs. I think the most fail-proof tool is the pot for boiling.